Warp Zone is a GameMaker game I created in 2012 for an online “intro to game design” course. 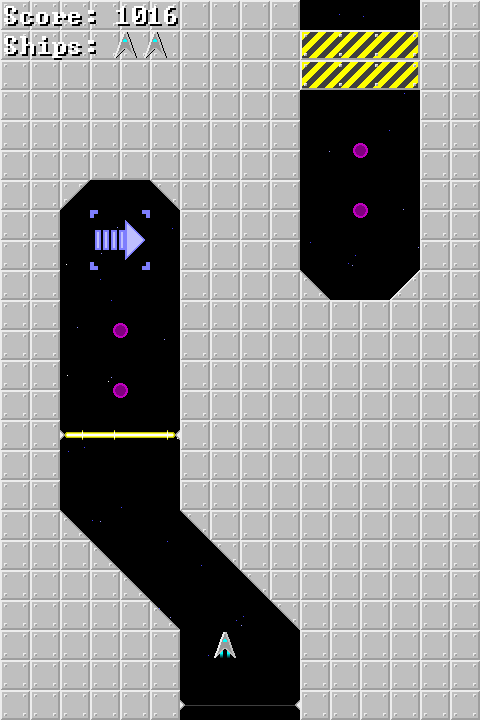 In it, you pilot a spaceship at warp speed through twisting tunnels filled with obstacles, each of which must be overcome using a specific tool: laser cannons, security scramblers, jump drives, or your portal device. The inspiration for Warp Zone came from the old DOS game PixelShips, whose “Warp Zone” levels were always a challenge to navigate. The sound effects were generated with DrPetter’s SFXr, and the in-game font is “Green Screen” by James Shields. Due to the tool requirements of the course, Warp Zone is for Windows PCs only. The download contains both a standalone executable and the source file it was compiled from (license: CC BY-NC-SA 3.0).